Exams boards have been ordered to tighten up GCSEs in four key subjects amid fears they are becoming easier to pass. Exams watchdog Ofqual wants changes to English literature, maths, history and geography GCSEs to ensure students cover the full breadth of the subjects. Education Secretary Michael Gove has suggested some GCSEs can be passed with too narrow a grasp of the subject. Ofqual said it wanted to ensure students covered the whole curriculum. Its chief executive Glenys Stacey said: "We are tightening GCSEs in these key subjects to make sure students cover the whole curriculum. "We want our young people to have the best possible educational experience, with qualifications that prepare them for the future. "The exam boards have welcomed this steer from the regulator and are to look again at these qualifications and how the rules are interpreted to make sure that young people taking them have to study an appropriate range and depth of the subject." The move to toughen up exams comes after an investigation by the Daily Telegraph which uncovered evidence of exam boards giving secret advice to teachers on how to achieve better grades for their pupils. It is also follows long standing concerns that some teachers have been "teaching to the test". Ofqual wants to see pupils encouraged to learn everything on the course rather than concentrating on a narrow range of areas. The Department for Education has said that more than 90% of the answers in one of the most popular GCSE English literature exams are on the same three novels - Of Mice and Men, Lord of the Flies and to Kill a Mockingbird. Just one in 200 pupils studies a book written before 1900. Edexcel later announced that an internal review, analysing data from all five awarding bodies for GCSE geography, history and English had found that candidates were "no more or less likely" to achieve certain grades with its exams compared with other boards. It said that it had also assessed the "breadth and depth of the exam specifications" and was confident they were of the appropriate standard set by Ofqual. Ofqual said that GCSE geography would be improved for first teaching this September, maths from this November, with history and English literature papers changed from September 2013. 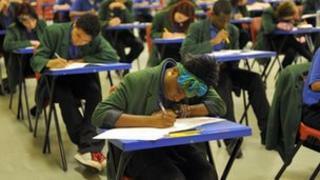 A Department for Education spokesman said: "It is vital confidence is restored in the exams system. We are committed to raising standards for all pupils. "We are pleased Ofqual is taking action to ensure that GCSEs in these subjects are more challenging, requiring students to demonstrate that they have covered the whole curriculum." Conservative chairman of the Commons education committee Graham Stuart said: "What we've got to make sure is that we recognise the importance of qualifications but remember what they're really about, which is education in the round. "And that's what we want and today's announcement should give people confidence that their children are going to be taught the whole subject - not just the bits that teachers think may come up in an exam."